KIEV, Ukraine -- As the country’s eastern conflict drags into a second year, Ukraine’s military leaders are trying to learn from past mistakes. 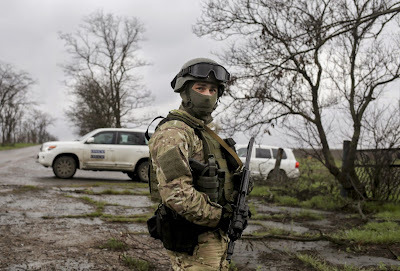 A Ukrainian serviceman guards the area near the Shyrokino village of Donetsk, Ukraine, on April 19. They are trying to be better trained and prepared, because no one knows when the warm weather might push this frozen conflict with pro-Russian separatists into all-out war again. And they are calling up the able-bodied men of Ukraine in droves to turn the military that had only 6,000 battle-ready troops before the start of this conflict into a standing force a quarter-million strong. But not everyone is heeding the call to arms. “I decided a long time ago that I wouldn’t respond to the order,” said Igor, a 25-year-old worker with a nongovernmental organization within Kiev, who received a draft summons in February. The prospective soldiers in this article spoke on the condition that their last names be withheld because of the risk of penalties if they were to be identified as draft dodgers. Igor is, by most measures, a shoo-in for the service. He’s a reserve officer, a radio specialist, and he participated in the 2013-2014 protests on Kiev’s Independence Square. But between one-third and one-half of the more than 6,100 deaths in the Ukrainian conflict were in the military, and Igor cites systemic problems — such as draft commanders who ask for bribes, and commanders, including the president, who maintain Russian business ties while asking soldiers to die for Ukraine — as reasons why he and many others cannot bring themselves to serve. “We do have some problems in the mobilization,” acknowledged military spokesman Vladislav Seleznev, when asked about cases like Igor’s. Rank-and-file soldiers can make upwards of $200 a month, with commanders eligible for far more. But those who shirk the call to duty — or go AWOL, as about 13,000 have — risk fines and years of jail time. In one recent case, a journalist speaking out publicly against the draft was charged with treason. But that isn’t enough to scare many potential draftees from dodging. “I would rather sit in prison for three years — and be fed and secure — than serve,” said Andrey, 26, a metal plant worker who was drafted in March. Andrey is from Slovyansk, an eastern Ukrainian city that came under heavy assault last summer, with troops eventually wresting the city from pro-Russian rebels. But the local population’s sympathies are still divided, and of the approximately 40 people Andrey knows who recently received draft orders, he says only one is actually responding. “We were fighting for autonomy, for the right to live and work in our own region. When the army came, they just bombarded us for two months in a row,” Andrey said. Though penalties for draft dodging are steep, the process is fairly straightforward. Summons are sent to the city where one is registered — normally a birthplace or place of work. But if one has moved or has a job that is not officially registered, it is easy to hide in plain sight, as Andrey and Igor are doing. The military says it has completed about three-quarters of the planned mobilization, now in its fifth wave, with a sixth already proposed. Response rates vary widely across the country, however: Igor’s home region of Kharkiv, for example, has the most abysmal turnout, with only about 17 percent of those receiving draft orders responding. Meanwhile Lviv, in the far west, reportedly boasts the highest response rate, with near full turnout. But even with the majority of draftees turning up for medical checks, the military is worried. Rotating soldiers off the battlefield, they expect only 15-20 percent to return voluntarily. New soldiers get only 26 days of general training, plus a week or two to practice their specialization. So without a steady stream of recruits, they worry that the quality of soldiers could drop. Only 1 in 8 troops is a volunteer, not nearly enough to make up the recruitment gap. “The more people that will respond to the mobilization, the better chance we have of sending the most prepared, motivated and best soldiers to the ATO zone,” Seleznev said, referring to the combat zone. But military experts say the recruitment system suffers most from bad management; the legacy of years of post-Soviet decimation. Despite the databases the administration is building of soldiers, their skills and their defections, Arestovich pointed out that specialists are often ignored in favor of funneling more people to the front line, and families of slain soldiers often must fight to get their promised benefits. As the Interior Ministry starts to prosecute no-shows, human rights advocates are also speaking in defense of the dodgers. “We can’t win only by the numbers, we have to win by the quality of our soldiers,” said Oleksandra Matviychuk of the Center for Civil Rights in Kiev, arguing that the military should offer more draftees noncombat roles. Maxim, 23, who was drafted in the fall, is a Seventh-day Adventist, and thus, a pacifist. But he is also a competitive athletic fighter, which he fears will make a military review board skeptical of his religious convictions. More pressingly though, Maxim doesn’t want to go to war because his wife is five months pregnant with their first child. If he has to, he said, he would try to get a Romanian passport, for which he is eligible as a resident of a border town. “You know, I would go serve as something like a medical worker,” Maxim said.